If you love to river fish and trade stories, tips, and tricks with some of the best in the business, then a river fishing "rodeo" is the place for you. 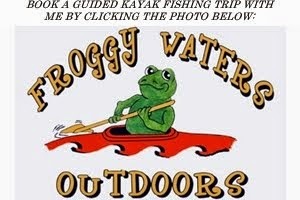 The tradition started years ago on some of the state river fishing forums in Georgia and Alabama, then migrated to RiverBassin.com. Now there are all sorts of river rodeos across the southeast and mid-atlantic. A rodeo typically consists of 4 days of fishing, camping, and camaraderie. A lot of guys might make it for just a day, others a couple of days, and some guys will be there for the whole shebang. 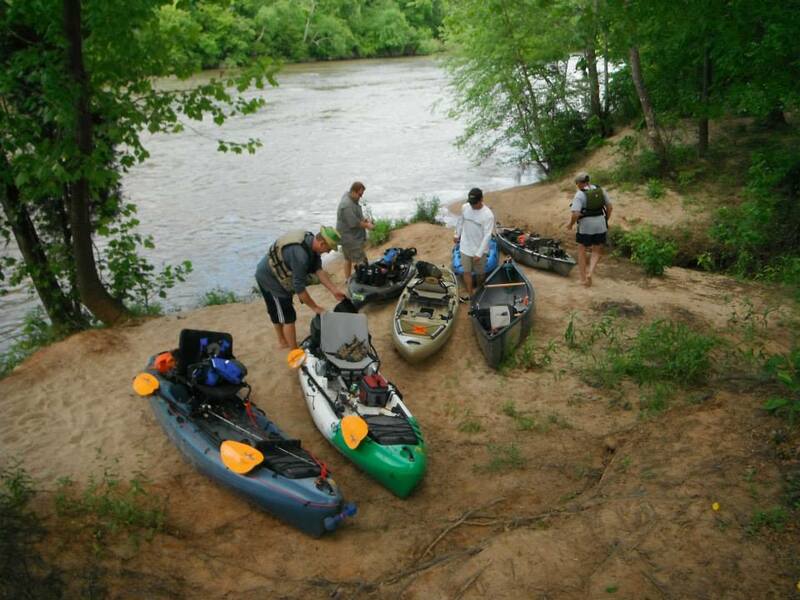 This past weekend was the Carolina River Fishing Rodeo and as usual it was a lot of fun. I got to see a lot of old friends and meet a few new ones as well. Here is my recap. I headed down toward Charlotte on Friday afternoon. My goal was to set up camp and then meet-up with good friend Eric Boyd for an afternoon trip with the fly rods. The 3 hour drive to the campground, Cirlce J Music Park, actually went pretty fast. I even managed to drive past Bass Pro Shops without blinking an eye. I pulled into camp to find Tread and Carolina Mike. After introducing myself to Mike and catching up with Tread, I set-up my tent and got my gear unpacked. After stringing a fly rod and packing a backpack, Tread and I were on our way to meet Eric for a quick trip. We were at the parking area within about 10 minutes and began trekking down a partially overgrown trail. A quarter-mile later, we were dropping into the river. It was a treat for me. The shoals, chutes, and rapids were a nice change-up from most of the lazy rivers in central NC. I began throwing a tube fly that Levi Blazer tied for me, but had no luck. In the meantime, the other two hooked up with solid smallies. Eric caught his on what I will call a "swimming woolly bugger" and Tread on a Yamamoto hula grab. 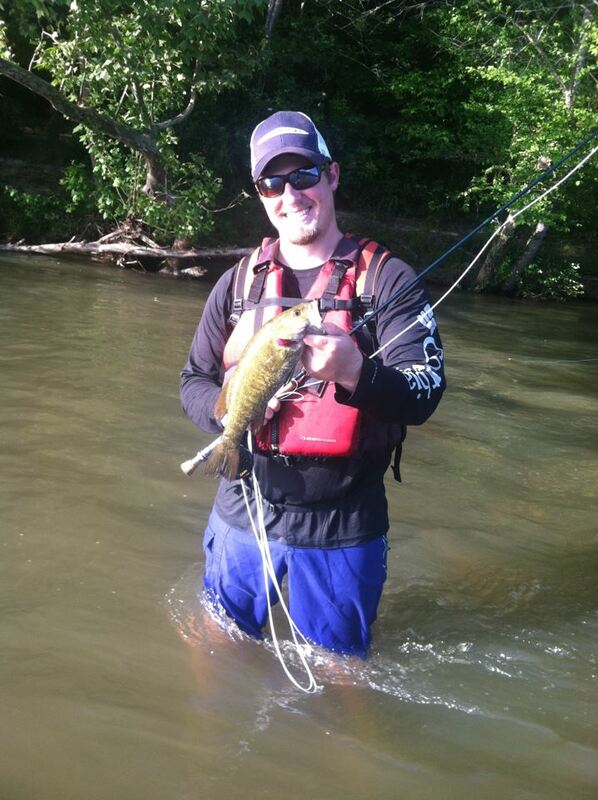 I then switched to a clouser minnow and after another 30 minutes, landed a short smallie. It wasn't much, but it was a start. Shortly after, I changed flies again - this time to a part hellgrammite, part leech, part crayfish streamer. On my first cast, I hooked my second smallie in what would be a sign of things to come. I began fishing the fly fairly slowly - allowing it sink completely before I began my retrieve and then using the current to bump it down river as I made sharp, well spaced strips of the line. The pattern was working and the smallies were loving it. No giants were landed and the biggest smallie I hooked, roughly 15", threw the hook on a jump, but I managed a dozen solid smallies with a few in the 13"-14" range. On the fly and on a totally new river - that was a blast! One of my better smallies on the fly for the day - around 14"
We headed back to camp where a few others had rolled in for the night. We sat around the campfire telling fish stories and talking about life until we couldn't keep our eyes open any longer. We also got loaded up on plastics by Carolina Mike - a huge thanks to him for that! The next morning we were hoping to be on the water fairly early, but as these things often go, we got delayed. 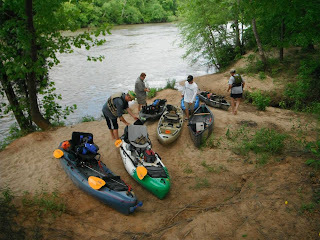 I needed to be on the road by mid-afternoon, so instead of doing the 6 mile float with the rest of the group, I decided I would paddle up-river and float back to the launch. The plan sounded great in theory and a couple of the locals agreed that the fishing should be good. But the river had other plans. The flow nearly doubled overnight as they began letting water out of upstream dams. And as if the upstream paddle against 2000 CFS wasn't enough, the wind was blowing directly in my face. That was one of the longest mile long paddles I have ever made, rivaled only by a day Bill and I had on the James River back in the spring of 2011. After what seemed like an eternity, I made it to a great looking spot, parked my yak on a sand bar, and started casting. Within minutes I hooked a chunky bream, then another, then a smallmouth - all on the hellgra-cray-leech. I put down that rod and picked up my 9 weight, TFO BVK rod with Allen Alpha III reel. I had tied a steel leader on it earlier in the morning and began tossing a 6" foam head minnow in hopes of enticing a musky. But after many casts, I had no fish. I switched back to the hellgra-cray-leech and caught another smallie, a largemouth, and 4 nice size crappie. In fact, the crappie were just as big or bigger than the bass. A chunky river crappie over 13"
I was even seeing some activity on the surface, but I couldn't get any takers on my surface offerings. I switched to a 2.5" clouser minnow in hopes of enticing a few more crappie or smallmouth. About ten casts later I was stripping the fly in and BAM. It got trucked not more than 5 feet in front of me. I knew by the size, shape, and color of the fish that it was a musky. But the fight was over as quickly as it had begun. The line snapped/cut almost instantly after the hook set. Of course the fish would take a small fly on the lightest rod I had with me - a 5/6 weight - instead of the heavy rod with a big fly attached to a steel leader. That is fishing, I suppose. I was bummed out that I didn't land the fish, but even the short tussle was enough to get my heart pumping. I got back in the yak and worked my way down-river, but would land only a small largemouth and a bream the rest of the day. The current and wind were making boat positioning tough while trying to cast, so I was ready to call it a day by early afternoon. I paddled out the rest of the float, packed up everything, and headed for home. On the ride home, I couldn't help but think about the one that got away. I also reminisced about how much I miss smallie fishing, particularly all the amazing days I spent with my dad and so many other good friends wade fishing for smallies in the Susquehanna River growing up. It was a great weekend with some great folks. I wish I got to fish with them all more often. But it is also nice to come home to a loving woman and a couple of good dogs. Hopefully I can get out on the water again this week and chase that adrenaline rush at the end of a line. Tight lines! That was my kinda trip! Congrats on the fly action, and nice crappie. Thanks Jeff! I could see you joining us on a rodeo in the future. Someone mentioned doing one in the fall, but I am not sure if that will happen or not. Tight lines!